Really sparked and shines! The band is very comfortable adjusts to your size. Beautiful watch and a great price!! This sparkling watch will make a strong statement with your attire. 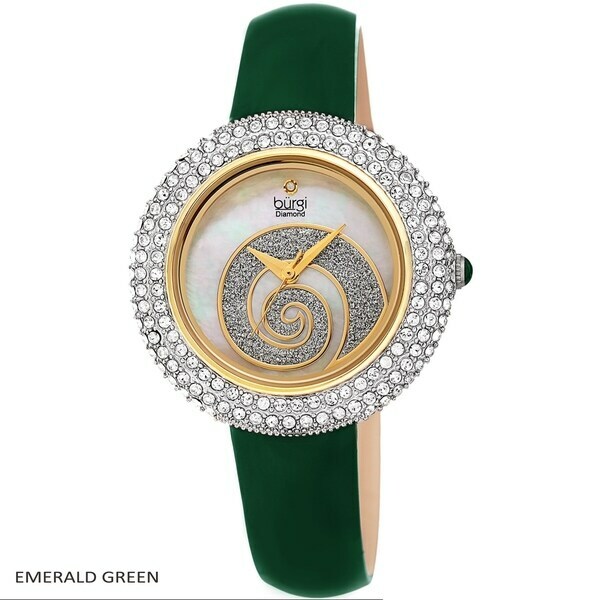 Presented by Burgi, the glitter filled swirl on the dial is surrounded by studded crystals. It features a genuine diamond at the twelve o'clock position. Gift this timepiece to the woman you love for any occasion! Oh my goodness it’s gorgeous! Truly quality piece! So glad I grabbed it!The color is deep blue and the face just wonderful with all the little crystals. It’s beautiful on my wrist and appears to be a much more expensive piece. Very pretty band is a shiny leather look. The only draw back is I wish they would make the band a bit longer. Beautiful watch! I get so many compliments; even my hubby thinks it’s gorgeous. That says a lot! Considering that I got it at a tremendously reduced price, I’m ecstatic with this purchase. Highly recommend!!! This watch is classy and the price is not bad either love it had a lot of compliments already. Love the look and feel the watch and it keeps good time. Looks good on my wrist.! I always love swarovski its quality.